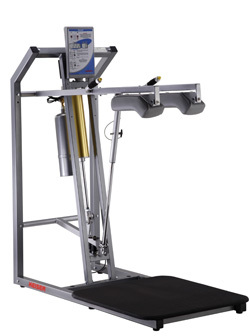 Keiser�s Air300 Squat combines low impact technology with the ability to move safely at higher speeds. The result is unmatched, explosive power � the key to superior athletic performance. Thumb buttons for resistance control are conveniently positioned on the ends of the handgrips for greater control and stability during the exercise. In addition, a range-limiting feature helps prevent ligament and joint injury to the knee.